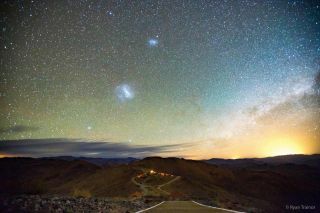 The Large and Small Magellanic Clouds above Las Campanas Observatory in Chile. When it came to churning out stars, the Milky Way's nearest galactic neighbors got off to a slow start. But they're picking up speed now. By making the first detailed chemical maps of a galaxy beyond our own, scientists found that star formation in the Large and Small Magellanic Clouds has spiked in the recent past, after a lag. The new results not only provide insights into the most abundant type of galaxies in the universe, they also help to improve understanding of the evolution of the Milky Way. "It's been challenging to map out their full structure," David Nidever, an astronomer at Montana State University, told reporters last month at the 233rd semiannual meeting of the American Astronomical Society in Seattle. Nidever and his colleagues used the Apache Point Observatory Galactic Evolution Experiment 2 (APOGEE-2) survey to obtain precise observations of 5,000 stars in the Magellanic Clouds. By mapping out how heavy elements are distributed through the stars in the galaxy, the astronomers were able to model approximately when generations of stars were born. "With this new capability, we can study the Magellanic Clouds like never before," Nidever said. Visible only from the Southern Hemisphere, the LMC and SMC were named for the explorer Ferdinand Magellan, who led the first European expedition to circle the globe. The pair are dwarf galaxies, smaller collections of stars that can contain anywhere from 1,000 to 1,000,000,000 times the sun's mass in gas, dust and stars, according to Nidever's paper on the new work. The Milky Way is surrounded by dozens of known dwarf galaxies and scientists suspect there are dozens more hiding in the fringes, their small, wispy forms making them hard to detect. Although they qualify as dwarf galaxies, the LMC and SMC are unusual, building stars much slower than their counterparts. The difference has been a long-standing mystery for scientists. "There should be a relationship between the mass of the galaxy and early star formation rates," Nidever told Space.com. "The Magellanic Clouds fall way off of that trend." The Sloan Digital Sky Survey's APOGEE-1 project studied the Milky Way from the Northern Hemisphere from 2011 to 2014, providing "unprecedented insights into the dynamical structure and chemical history of the galaxy," according to Sloan's website. Based in New Mexico, the first version of APOGEE was limited to the Northern Hemisphere. In 2017, the almost-identical instrument APOGEE-2 was installed at the Las Campanas Observatory in Chile. The instrument began observing the LMC and SMC the same year. The first stars formed from dense clouds of hydrogen and helium, converting a small percentage of the gas into heavier elements. When they exploded in violent supernovas, they seeded their environment with these elements, which were drawn into the next generation of stars, and the cycle continued — with each generation of stars converting more matter into heavier elements. With APOGEE-2, Nidever and his colleagues were able to probe the chemical makeup of thousands of stars in the LMC and SMC. The scientists folded that makeup into simulations to determine how long it took generations of stars to form. That way, they were able to reconstruct the star-formation history of both galaxies. Unlike the Milky Way, the Magellanic Clouds got off to a slow start, building new stars about 50 times slower than our own galaxy, Nidever said. But despite this lazy start, the LMC had a recent kick that caused a six-fold jump in new stars. "It's never too late to get active," Nidever said. What caused the recent uptick, which happened about 2 billion years ago? Nidever said the most likely source is that a recent brush with the SMC fueled starbirth in the larger dwarf galaxy. "We can see features that they've interacted in their structure," Nidever said. The Clouds' slow start contrasted with other dwarf galaxies around the Milky Way. Star-formation rates in the pair are even lower than expected for their mass, Nidever said. A star-forming region of the Large Magellanic Cloud. The tug of the Milky Way's gravity causes gas clouds in the nearby dwarf galaxy to collapse into new stars, which light up the galaxies. "That's kind of a mystery," he said. The difference likely stems from different environments. Most of the dwarf galaxies studied so far have made several trips around the Milky Way. Their gravitational interactions with our galaxy may have helped to turn their gas into stars. The LMC and SMC, however, are most likely taking their very first spin around the Milky Way, according to previous research. That means they spent about 10 billion years building stars in isolation, without a massive galaxy to boost their starbirth, the researchers said. Only in the last few billion years have the pair begun to interact more frequently with the Milky Way and with one another, boosting how quickly they build their stars. But things are just getting started for the LMC and SMC. In about 2.5 billion years, the LMC will merge with the Milky Way, kicking off a flurry of star formation. "Many of the stars [in the Magellanic Clouds] will be thrown into the halo of the Milky Way, and will dramatically affect the makeup of its halo," Nidever said. The merge will cause a burst of star formation in the residual gas and dust of the Magellanic Clouds, he added. After getting off to such a slow start, the pair will wrap up their final years in a storm of stellar fireworks. The research has been submitted to the Astrophysical Journal and is available on the preprint server arXiv. Follow Nola Taylor Redd on Twitter @NolaTRedd or Facebook. Follow us on Twitter at @Spacedotcom or on Facebook. Originally published on Space.com.